There is an unbelievable spiritual war within the human heart. All Christians can cry out with the apostle Paul, “For I do not understand my own actions. For I do not do what I want, but I do the very thing I hate” (Rom. 7:5). Yet, such frustration should not lead us to apathy in the battle against our internal sinful tendencies. Paul also commands that we must “Put to death therefore what is earthly in you” (Col. 3:5a). 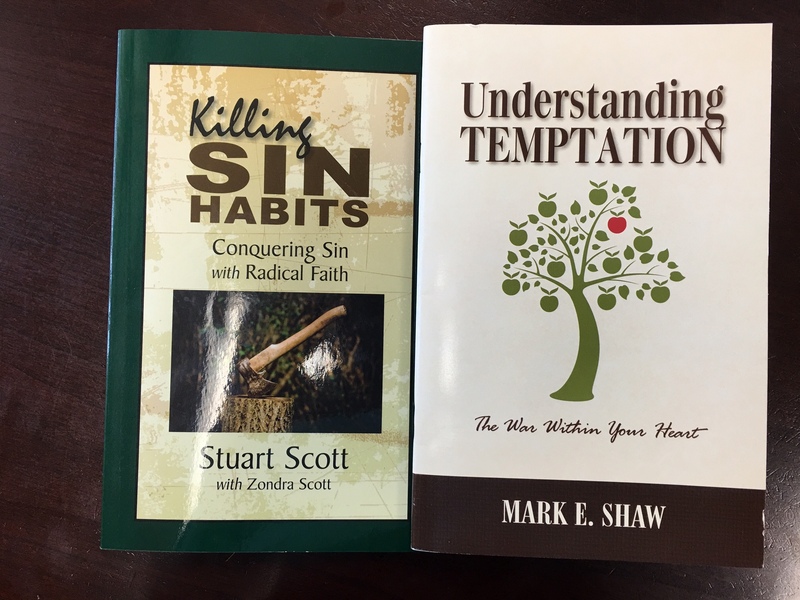 To help us to that end both Stuart Scott and Mark Shaw have written simple guides to the battle with indwelling sin. Understanding Temptation and Killing Sin Habits both serve as spiritual guides to our sin struggle, yet only one offers the needed practical help. Booklets are invaluable resources. There are times where a simple, concise introduction to subject is needed. Booklets can offer some basic information, re-orientation, and encouragement in manageable and punctuated form. Yet, obviously, booklets have their shortcomings. There is only so much that can be discussed in the space afforded to a booklet, and often only simplistic explorations can be developed. In the case of Mark Shaw’s Understanding Temptation those shortcomings are noticeable. It’s not that Shaw’s work is poor, it’s not. He has written a wonderful Biblical introduction to the subject of temptation, focusing particularly on John’s expression “the lust of the flesh, the lust of the eyes, and the pride of life” (1 John 2:16). Shaw walks readers through the details of these individual descriptors, observing what kind of temptation they offer, how they each uniquely cloud the character of God, and how Christ offers us a better response then surrender to these temptations. The brief booklet, sitting at only 34 pages, is loaded with Scriptural references. Furthermore, Mark’s counselor heart pours forth; it feels at times like Mark is sitting across from the reader giving them real heart-felt counsel about temptation. The booklet, however, does not offer much in the way of real practical help in fighting sin. The spiritual truths are all there, and we should expect nothing less from such a wise Biblical counselor as Shaw. Yet, many Christians will know these truths. There remains, nonetheless, a struggle to implement and apply them. We continue to cry out with Paul over our own inner confusion, and need strategies for saying “no” to ungodliness and “yes” to righteousness. Even Mark’s passing example of alcoholism simply suggests alcoholics need to stop loving alcohol and start loving God more. That may be true, but it’s not much in the way of serious counsel. It’s not that I believe Mark doesn’t have practical help, I am sure he does. The booklet format, however, simply does not afford him space to go into great depth with a battle plan. The practical counsel is either missing or simplistic (his exploration of the “antidotes” to each temptation on pages 27-30 is very short and generic). In contrast to this work is Stuart Scott’s booklet Killing Sin Habits: Conquering Sin with Radical Faith. Like Shaw, Scott explores the cycle of temptation. He notes the power of habitual sin, the struggle to say “no,” and the patterns of behavior that accompany it and set up our failures. For Scott, sin is challenged and overcome by the dual swords of “mortification” and “vivification.” Or, in the more natural words of Paul, to “put off” sin habits, and “put on” godly habits (Eph. 4:22-24). Scott prioritizes “exercising daily faith” as the means to fighting temptation and kill sin habits. Like Shaw, Scott’s theology is sound and full. His understanding of the gospel, of the perversions of sanctification (mysticism, pietism, antinomianism, legalism, etc. ), and of the Christian life are all touched on in this short work (74 pages). The difference, however, between the two works, is Scott’s discussion of practical application. He offers readers, then, an annotated list of hindrances and applications, complete with Scriptural references, and promotes confession and repentance where appropriate. Yet this is not the only place in the book where Scott offers practical help. Throughout the work he is commenting on application, touching on the details of life. His work is simple yet instructive. There can be a temptation sometimes within Biblical Counseling to offer lots of spiritual guidance and overlook the practical help. It’s not that it is endemic to the field itself, but it is common enough that it concerns me. The difference between these two works in informative because it reminds us of the need to not only point people to the spiritual truths they need to grow, but also to seek to help them apply these truths in daily living. I can recommend both booklets, as they both speak great truth and give important instruction. Yet, only Scott’s book gives us the help we need to apply the truths.